Please welcome Olivia of DIY Mother for a guest post on 5 DIY decor trends that she believes need to be added to the “NO-NO” list. All opinions are Olivia’s and we welcome yours, too. Please leave a comment after the post to tell us if you agree or disagree. In all of the hours I’ve accumulated pinning home decorating things on Pinterest, I’ve noticed that there are a few trends that just won’t go away. Most of them are DIY projects. Women love DIY projects; especially for home decorating. Although I write for a DIY blog, even I can admit that certain things don’t need to be DIY; Pinterest has ultimately made everyone think that they can do everything themselves. When it comes to decorating your home, there has to be a balance between DIY and new. Below are my top 5 DIY decorating no-no’s. To me, tufted ottomans just don’t belong in the living room. You can’t put your drink on it, and you certainly can’t rest your feet on it. So what’s the point in putting it in front of the sofa and pretending that it’s a coffee table? 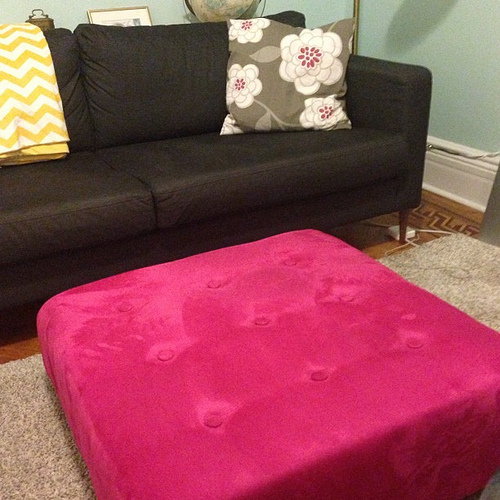 Therein lies the issue: people are repurposing their coffee tables into tufted ottomans. Generally, when people repurpose, it’s to get MORE out of a piece of furniture. “Repurposing” your coffee table into something that serves no purpose is pretty silly. I’m so tired of chevron print; and that’s how I know it’s probably going to die out soon. Decorating staples and traditions will never get on your nerves. Chevron doesn’t grab your attention, it stands in front of you and screams at you until you notice it. I’m hoping that 2014 will be the year that people finally give the chevron print back to Charlie Brown and choose another print to favor. There are so many other geometric prints that can be swapped out, but for some reason chevron just won’t lay down and die. Starburst mirrors date back to King Louis XIV. He was known as the Sun King and as he would gaze at his own reflection in the sunburst mirror, his face would be at the center of the sun. 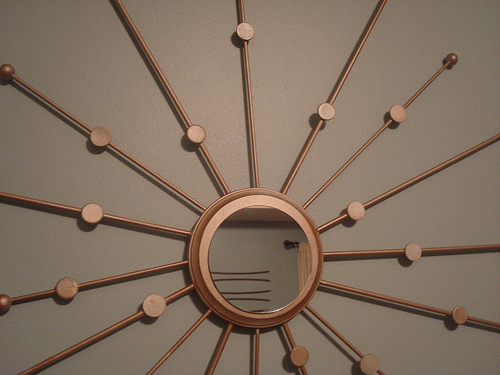 Over the past few years, these starburst mirrors have become the most overdone DIY home decorating project. There’s no doubt that starburst mirrors add a focal point to a room; and some of them can be very appealing. But using popsicle craft sticks to recreate a grand, baroque mirror is just not wise. It doesn’t matter what color you paint the sticks, it will still look like an elementary school craft. Chalkboard paint is amazing in theory, but Paul Anater from Kitchen and Residential Design reminded us that it’s made from the same stuff that drywall comes from. Pretty dangerous for the kids who utilize the chalkboard wall the most! The fact is that they’re messy, dusty, and they belong only in classrooms or playrooms. What is so appealing about being able to write on an entire wall? From every picture I’ve seen on Pinterest, no one is using chalkboard walls for anything but a grocery list. And a grocery list needs to be in your pocket, not on the wall. When I moved into my first house, the master bathroom was covered in wall decals. To be honest, it’s tacky. What’s worse than the chic designs are the motivational or religious phrases. No one wants to read a paragraph about falling in love or what “home” feels like. This is a trend that’s specific to our generation. Short, kitschy phrases have become our means of communication. Thanks, Twitter! So, how do you feel about Olivia’s DIY No-No’s? Do you agree? Disagree? Anymore decor trends that you think needs to be a thing of the past? Read the comments to see what I think, and make sure you tell us what you think. Aw dang! We totally just did a strip chalkboard wall! It’s so darn cute though. I’m glad we didn’t do an entire wall. I had all these plans to draw cool stuff and didn’t haha. I did however find a Chevron Headboard that I’m getting for my room! I agree with sunburst mirrors I’ve never been aa fan. I’m super wierd about mirrors mine have to look a certain way. Girl, I love chalkboard walls! This is why I love to get guest bloggers on my page, so that readers can see the different opinions that other designers/bloggers/diy-ers have. Thanks for sharing useful tips on things one must avoid in home decoration. Tufted ottomans, look nice, but agreed with your point that it can not be used in the living room. Love this article- all SO true! Also- been struggling to find the perfect clean light grey/greige and hopefully Irish Mist is it- LOVE how it turned out for you! Such a fresh, sophisticated update- amazing how much paint can lend or take away if you don’t know what you’re doing.